This is Part 1! Be sure to listen to Part 2 also. Who knew gelatin could be so beautiful (see that book cover below)… or so marvelously healing? As Sylvie McCracken found out, gelatin is one of the foods we should all be eating more. It's crucial for many aspects of our health including bones, teeth, skin, and more. Gelatin is a secret no more, thanks to Sylvie's great work! 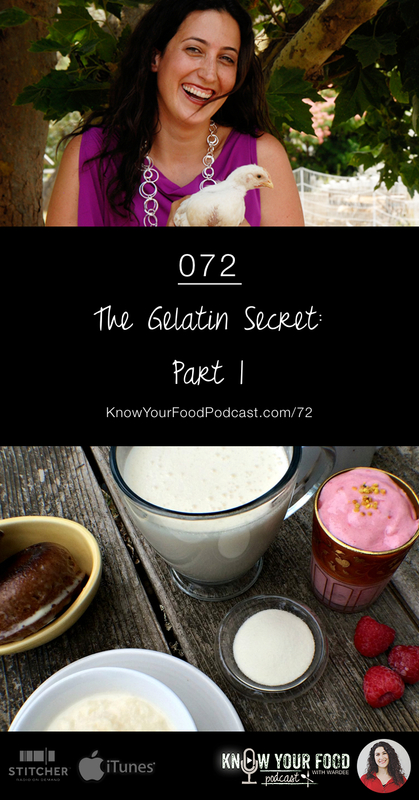 Get to know Sylvie, her family, and more about gelatin through the links and information below, and of course through this podcast (which is part 1 of 2). Check out Part 2 here. Plus… the tip of the week! An Announcement and Welcome to Survival Mom Listeners! My podcast is now in the line-up at The Survival Mom Radio Network. I'm so excited to join the ladies over there (many are great friends). 2) Over at Survival Mom radio, my episodes will air on Wednesdays. This will affect you if you listen from there. If you listen from here, the episodes will continue to go up on Friday. And a big, big welcome to everyone coming over from Survival Mom radio! This tip totally makes sense with us talking about gelatin today, so here's your assignment: eat more of it! How to eat it? Well, you can start with consuming more broth/stock from pastured animals. That's the most basic way. You can also add it to your tea or supplement a cup of broth more of it. Finally, you can cook with it — perhaps in the Kombucha Jello (pictured above) or in this Chocolate Custard. Sylvie's book The Gelatin Secret contains even more recipes and ideas! 1) When soaking the beans, you give the alternative of adding baking soda to the soak water. Is this in place of the acid medium or in addition to the acid medium? Wouldn't baking soda neutralize the acid medium? What exactly is the acid medium doing that plain water won't do? Sylvie is a celebrity personal assistant and mom of 3 by day, paleo enthusiast and author by night. She and stay-at-home-dad hubby, Eric, each lost over 65 pounds with paleo and continue to improve their family's health with food and lifestyle tweaks. Sylvie blogs at Hollywood Homestead. You can also follow her on Facebook, Twitter, Pinterest, or Instagram. Sylvie's first eBook, The Paleo Survival Guide, has helped thousands of families succeed with paleo. 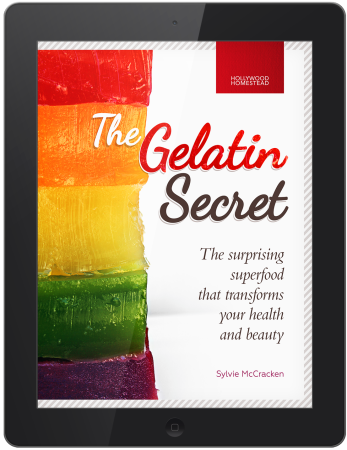 Sylvie just released her second eBook, The Gelatin Secret. Sylvie is also the author of The Paleo Survival Guide. I would love to hear from you! Do you have questions for Sylvie or comments about anything shared in this episode? Like this podcast? Please help me reach others by using the share buttons at the top of this post. Thanks! I refuse to eat meat and byproducts of meat that I don’t know for sure have been raised and slaughtered humanely. Thus, my family and I raise our own pork, beef, chicken, duck and goat dairy. And we slaughter it all too, except for the beef…perhaps done day we’ll be at that point! My question is: where can I find s gelatin powder that is certified under my conditions? I grew up on Knox, but I’m not interested in using products like that now. Please help! I love gelatin based desserts and would like to incorporate the powder into more of my diet, in addition to the broths we already eat. Amy, I don’t know of a source of gelatin that is pastured. I’m sorry! We buy Great Lakes which is kosher. I’d suggest you contact them to inquire more into their standards. Hi, Rebecca — I have heard of this company and have a dear friend who recommends this gelatin. I have not used it myself but I would if I had the opportunity. I did not listen, but was wondering if your gelatin can come from bone broth and not worry about buying packaged gelatin? Kim — Of course! If you eat plenty of bone broth from pastured animals, you’re all set! I’ve found acid mediums toughen beans and I believe I looked into the soaking and found that soaking in salt water works well for digestibility. Do you have thoughts on using salt? I am on you mailing list and have followed you for some time – since I think Simple Lives Thursday’s. We do recommend Great Lakes gelatin and collagen. 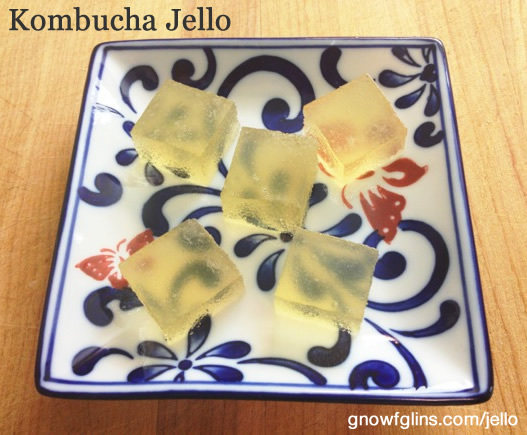 Yes you can drink gelatin or add to your favorite beverages or broth.